These books are year-long devotionals for boys and girls aged 10–14 that will help them in their walk with God by including inspiring Bible readings, relevant explanations, thinking points and prayers. The topics include some of the core subjects the Bible, while also looking at some more specific themes for boys and girls. Each devotional is engaging, simple and up-beat. This year-long devotional for boys aged 10–14 is packed with inspiring Bible readings, relevant thinking points and life-changing prayers. There are a range of topics which span across the entire Bible, providing boys something that is engaging, simple and up-beat. Some of these include the armour of God, the names of Jesus, the life of David, and a look into the book of Judges. One You One Year - 365 for Boys was published by CWR in April 2019 and is our 1340th best seller. 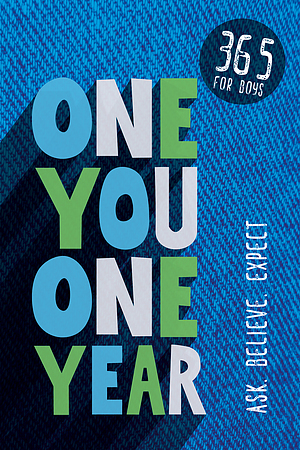 The ISBN for One You One Year - 365 for Boys is 9781782599944. Be the first to review One You One Year - 365 for Boys! Got a question? No problem! Just click here to ask us about One You One Year - 365 for Boys.